Raising the point that he had been advised by his lawyers that there was no reason for him to resign, he said he chose to make the decision in keeping with his ‘moral conscience’ and on behalf of the party and the government. 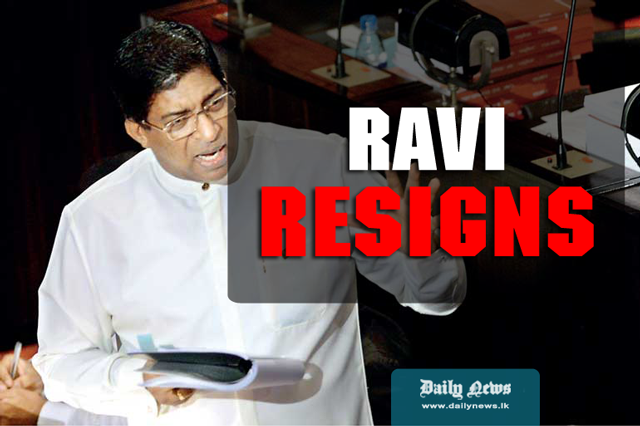 The former Minister said that he was proud to sacrifice his position for good governance and that he would with equal pride take his place among the backbenchers in Parliament, knowing that he had sacrificed his position for the greater good. Extolling the virtues of the ‘Yahapalanaya’ government, the former Minister noted that never before had a sitting Minister been hauled before a commission to testify on his actions – “This is a mark of the good governance government,” the former Minister said. He continued to defend his position regarding the allegations brought against him in Treasury bond issue and furnished the Parliament with details of a Seylan Bank loan he had taken in order to buy the Monarch apartment at the centre of the controversy. The former Minister also pointed out that he had only obtained lease and subsequent purchase of the Monarch apartment as a result of his daughter’s friendship with Annika Wijesuriya and that there had been no ulterior motive to the transaction. Defending further his position, the former Minister said that his reputation was unblemished and that many of the 33 Joint Opposition (JO) members that had brought a ‘no-confidence’ motion against him were aware of his character. In conclusion the former Minister thanked his wife and daughter for standing by him through ‘this trying time’, even while facing numerous allegations of besmirched character, despite having done no wrong. WHY ARE YOU ALL ONLY CHASING BEHIND RAVI KARUNANAYAKE. WHAT ABOUT THE OTHER CABINET MINISTERS AGAINST WHOM CORRUPTION COMPLAINTS HAVE BEEN MADE? TWO OF THE MOST WANTED MINISTERS FOR SUCH CORRUPTION ARE, A MINORITY COMMUNITY POLITICAL PARTY LEADER FROM THE NORTH WHO IS ALLEGED TO HAVE SWINDLED MILLIONS OF RUPEES IN TRADE DEALS AND PAYMENTS FROM THE ROAD DEVELOPMENT AUTHORITY AND THE OTHER IS A MINISTER WHO IS A CLOSE ASSOCIATE OF DR. NEVILLE FERNANDO. THE PRESIDENT SHOULD BE BOLD ENOUGH TO BRING THEM TO BOOK TOO. IF THE COMPLAINTS AGAINST THEM IS PROBED, MANY EVIDENCES WILL WE REVEALED TO THE CID AND THE PRESIDENTS COMMISSION. Noor Nizam - Political Communication Researcher, Former SLFP District Organizer Trincomalee District and Stalwart and Convener - "The Muslim Voice". Nizam can make allegations, but welcome to give all evidence he has. As an SLFP supporter he will be having lot of information about former SLFP stalwarts.